There is a lot of competition on the baseball diamond these days in the big leagues. This year’s all-star break was an exciting one as usual. In this year’s all-star game there was a record of 10 homeruns hit, shattering the previous record of 6. One of which was hit by Alex Bregman in extra innings to seal the win for the American League. He also received the 2018 Ted Williams Most Valuable Player award. What was his trophy? How about a brand new Chevrolet Camaro SS. Bregman definitely likes his fast cars, choosing the Chevrolet Camaro over the Colorado ZR2. Since the 2019 Chevrolet Camaro is redesigned for the new year, let’s take a look back at a few past generations and see how it has evolved. The 1967 Chevrolet Camaro was one of the original pony cars to compete with the Ford Mustang during the muscle car era. The first generation of the Camaro is one of the most popular muscle cars to restore and modify whether a full restoration or full blown drag racer. It is unarguable that they are so popular with those clean body lines. The 3 years of the first generation are similar but have subtle differences. The ‘67 has round parking lights in the grille, ‘68 has rectangular lights in the grille, and ‘69 has no parking lights in the grille. Just some tricks to help decipher which year Camaro you might be looking at. The first 3 years of the Camaro was offered in base, RS, SS, and Z28 trim packages with a number of engine options. Engine options became more powerful as years went on as competition between manufacturers heightened. Some of the legendary engines include a 327 ci, 350 ci, 396 ci, and a beastly 427 ci. If you are a Camaro lover you might be aware of the 1969 COPO Camaro and the fact that it had that 427 engine pumping out an ground-pounding 430 hp. The second generation Camaro took over in 1970 which had some of the most beautiful body lines of all the Camaros. The newly designed Camaro has a sleeker appearance with a longer overall body and wider stance. The second generation of Camaro ran for about 11 years and throughout that stretch it received a few body design changes. Of course as the 1970s went on the muscle car era began to fizzle out along with the original power and aggression of the Camaro. Although still appealing the second generation ran until 1981. Recall the Transformers movie? You know that rusty, old yellow car that turns into Bumblebee? Yeup, you guessed it a 1977 Chevrolet Camaro. On to the third generation Camaro. Now that the muscle car era is officially over, it was time for a change and drastic redesign once again of the iconic pony car. The next generation took over in 1982 and ran until 1992; a good 10 year run. The third gen was probably the least changed of all Camaros, remaining relatively the same throughout the decade. Trim packages included the sport coupe, Berlinetta, Z/28, RS, IROC-Z, and even convertible. Engine options were rather simple with your choice of a 2.5L, 2.8L, 3.1L, 5.0L, and 5.7L. 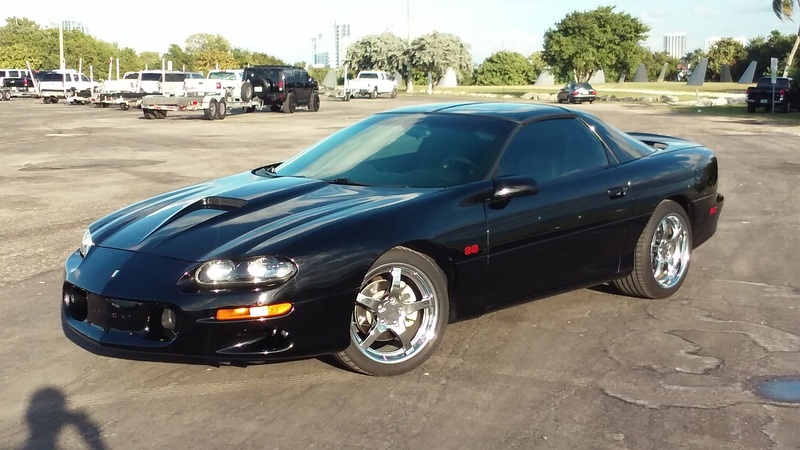 The fourth generation Camaro was produced from 1993 until 2002 where the Camaro legacy came to an end….or did it? The production of the Camaro seized in 2002 but future concepts began appearing throughout the years until it went back into production in 2009 after the Transformers movie exposed the concept in a big way. The fourth gen received some upgraded performance with a few different engine options including the 3.4L, 3.8L, and three different 5.7L engines. You could also choose between a 4-speed auto, 5-speed auto, or 6-speed manual. There were certainly more than a few special editions of the fifth gen including the 2013 Camaro Hot Wheels Special Edition, 2013 COPO Camaro, and 2013 Turbo Camaro Coupe. The new generation is highly popular due to its modern suspension and handling along with increased power to create the ultimate ride. There were certainly more than a few special editions of the fifth gen including the 2013 Camaro Hot Wheels Special Edition, 2013 COPO Camaro, and 2013 Turbo Camaro Coupe. The new generation is highly popular due to its modern suspension and handling along with increased power to create the ultimate ride. Engine options for the generation included a 3.6L, 6.2L, and 7.0L with choice of 6-speed auto or manual. Last but not least is the sixth sixth generation. Undoubtedly the most advanced and powerful Camaro. Slightly tweaked from the previous generation it shares the same platform as the Cadillac ATS and CTS so you know it will be a smooth ride. This generation can also be found in a Transformers movie; Transformers: Age of Extinction. Of course the new Camaro has its own special editions. From the factory you can order the 50th Anniversary Special Edition, Redline Edition, and a ZL1 that will be sure to throw you back in the seat. You will be able to choose between a 2.0L, 3.6L, 6.2L and five different transmissions. Even with a 3.6L V6 you will be able to experience 335 hp and with the LT4 V8 achieve an output of 650 hp. Pretty impressive for even a modern sports car.